The history of our lives with the Labrador Retrievers is quite lengthy but I’m going to do my best to summarize it so as not to turn this into a book but yet cover all the areas of events along with our dedicated involvement with our Labradors. I feel this is very important for everyone to know. There are a lot of people who get involved with dogs to breed and sell with no history with, nor knowledge of dogs what so ever. It takes a dedicated person to get involved with dogs because you are not only dealing with a living creature you are also dealing with the lives of the people to which you sell your puppies based on the emotional bond that grows between them. If things are not done properly it could be heart breaking. With this said, I will now step back in time to a very wonderful and memorable part of my life that I will never forget. I worked for a Veterinarian for 18 1/2 years and during the earlier years of this time I met a client had a Labrador that had just had puppies. As we talked, I learned of some of the history behind his dog and was very impressed with one dog in particular. This dog, named “Cadillac Mack”, carried several field titles, and through an article published about him from Ralston Purina, I discovered the man who owned him lived in Belleville, Illinois. I made it a point to meet this man because I was so impressed with the article on this dog. Another one of our clients had a Labrador with a pedigree behind her built on Confirmation dogs (Show dogs) which was impressive and I found out that he had a litter of pups and the sire was a son of the dog I admired so much. I had to have one of these pups. I, at this time, was more interested in show dogs, but my husband Tom was an avid hunter so I felt that one of these pups would satisfy both our worlds. We bought a female who we called “Micki”, and this was the beginning of our long but very rewarding journey with our Labrador Retrievers. The person, from which we purchased Micki, not only hunted, but also was involved with an A. K. C. Field Trial Club, to which we also got involved. We started field training with some of the members, and after a few Field Trial tests in which we entered, and competed, I got hooked. I wanted a Lab of my own so I could train and compete, also. Being interested in the confirmation dogs and wanting my dog to look like the breed standard set forth by the A.K.C. I had to find a blood line that would meet both type as well as carry the hunting and retrieving instinct. Through research I decided the pedigree of the dog I was in search of must carry the Sandylands heritage. Lucky for me at the next dog show I went to I met a couple showing one of their dogs and I loved it. I approached them after they finished showing, and as we talked I found out they had a single female pup born in a litter that carried the pedigree I was looking for. I told Tom about this when I got home, and we called the couple to make an appointment to see her. Needless to say we came home with this little yellow female Labrador that we named “Kandi”. I was in heaven. I now had my own dog that I could take training and actually compete with along with the guys. I received a lot of flak from the guys from the start because the ones we trained with had black Labs. I was even told by one of the guys that I had 3 strikes against me and they were 1) she was yellow, 2) she was a female and 3) she was a show dog. Well, it doesn’t pay to tell me I can’t do something because I’ll so everything in my power to prove you wrong. I DID JUST THAT. The first Field Trial I entered Kandi in, she took 3rd place against 20 some Field Trial bred Retriever pups. My little yellow, female show dog ate steak that night while others I trained with ate words. We continued to train every chance we could, and compete in as many A.K.C. Field Trials as possible. Micki and Kandi both did very well. Tom, and I were very pleased with them, plus we were having a lot of fun with our dogs. The last event we entered I took 1st place in my group with my little yellow female show dog. If just goes to show you what a little perseverance and research will do. I was determined and Kandi definitely had it bred into her to want to retrieve. The training time with others was fun and it definitely kept our dogs in shape. But it was far from resembling true hunting situations with the camo and all. We, along with a few other club members, found out about the United Kennel Club (UKC) and the Hunting Retriever Club (HRC). Through our research we could not find a club close to our area so 7 of us decided to form a club of our own. After all the proper paper work was completed we became RETRIEVERS UNLIMITED HRC. I was nominated and elected club secretary, and held that title for several years. At first the clubs logo was the same as the Hunting Retriever Club so we decided to get our own. I asked the club members to submit possible logos to be voted on, and received several. I submitted to the club the picture of a dog launching into the water, and during one of our meetings we voted on the club logo. It was unanimous. The dog launching into the water won hands down over the rest. This dog was Toms dog Micki. 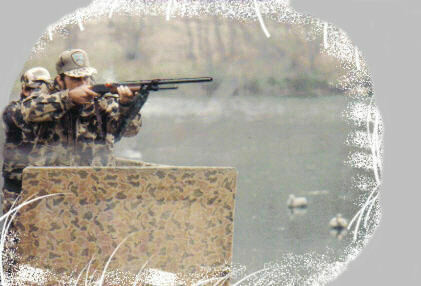 The photo was taken at our clubs 1st sanctioned hunt during the water test. HOW APPROPRIATE the words Retrievers Unlimited arched over the top of a black Lab launching into the water told it all and the best part was that the dog belonged to a club member. Our club was not going to be a follower; the seven of us were determined to be a leader. Retrievers Unlimited was formed in March 1988, and after a lot of hard work put forth by its’ club members, our club grew not only in club members but also in confidence to tackle almost anything. Tom and I were also growing with our passion for this sport. We had recently added another Labrador to our family, which was a male black Lab, out of pure English Field Trial dogs. We named him “Dylan” who later on in time became our first Hunting Retriever Champion. We were hooked, and ready to take on anything. At one of our meetings in the fall of 1989 the subject of conversation came up about the Spring Grand Hunt 1990. This event is the biggest event put on by the Hunting Retriever Club. Only Champion titled dogs are allowed to enter this event. Dogs come from all over the Country, so it’s very important that this particular hunt be, not only true hunting situations, but as close to PERFECT as humanly possible. There were a few club members that did not want to take on a hunting test of this magnitude, but after a very long discussion the ones that really wanted it won over. There was a lot of work to be done and arrangements to be made but we did it. Once again Retrievers Unlimited was determined to make it a great hunt, and we did. On March 30, 31 and April 1, 1990 not only did we put on a great hunt but it was announced that Retrievers Unlimited set the precedence for all the rest of the Grand Hunts to follow. WE WERE PROUD, tired but PROUD. The saying no rest for the weary is true. Late the night of April 1, 1990 (the last day of the Grand Hunt) my little yellow female show dog Kandi decided to have her puppies. It took all night, and with this being her first litter I stayed with her. She had 4 yellow females, 1 black female and 1 yellow male. We decided to keep the male which we called “Buster”, and later on was chosen by Ralston Purina 2 years in a row to represent their dog food ads. The first year he represented Purina HiPro titled “Nutrition That Never Blinks”, and the second year he was one of the dogs in the Purina Chosen by Champions group representing Purina Pro Plan food. We felt very honored. Buster went on to become our 2nd Hunting Retriever Champion. Retrievers Unlimited not only received high recognition from the Hunting Retriever Club for putting on a great Grand Hunt, but we gained quite a few new members from spectators who had come to watch this event. Our club members were always promoting Retrievers Unlimited to generate new club members. I myself wrote a quite lengthy article titled “OUR SEASON NEVER ENDS” which the club submitted to several sport papers to be published. This was, and is, a sport that the whole family can get involved with, and enjoy. Time went on, and both Tom and I were really enjoying ourselves with our new family of Retriever friends both people and dogs. We eventually added a few more dogs to our group and traveled all over with them. Tom and I were both licensed Judges so if one was asked to Judge, the other ran the dogs. Everyone knew us and welcomed us both with open arms no matter where we went. GREAT FUN!!!!! Finally in 1997 our Retriever sport came to an end due to an accident that Tom had which prevented him from doing a lot of things that were required in order to train and run dogs. We have an awful lot of great memories that we will both always cherish, and the best one of all is the fact that he and I, as a team, were able to put 4 Championship titles on dogs that we owned and trained ourselves. Dogs will always be a part of our lives no matter what. I guess you can say it was bred into both of us. Click here to watch our memorial video.